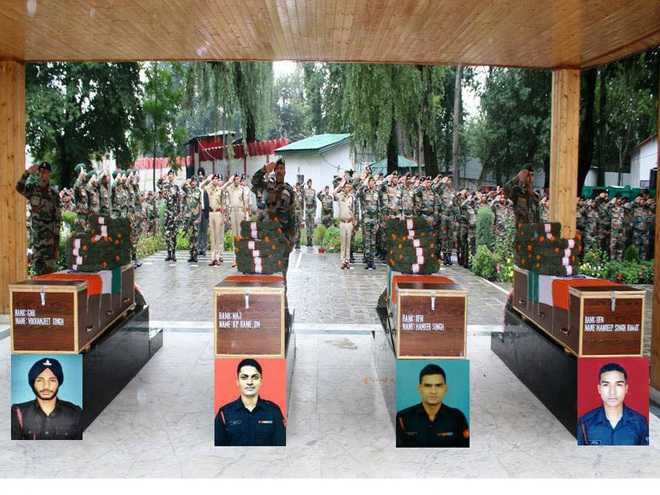 The Army on Wednesday paid tributes to its four soldiers, including a Major, who were killed in a fierce gunfight in north Kashmir’s mountainous Gurez sector on Tuesday.The tributes were led by Srinagar-based 15 Corps chief Lt Gen AK Bhatt at a ceremony at the Badamibagh cantonment in the city. Director General of Police SP Vaid was also present, a defence spokesman said.The bodies of the four soldiers were flown for their last rites to their native places, where they would be laid to rest with full military honours, the spokesman said.“In this hour of grief, the Army stands in solidarity with the bereaved families and remains committed to their dignity and well-being,” the spokesman said.The slain soldiers included Major Kaustubh Prakash Kumar Rane, Rifleman Hameer Singh, Rifleman Mandeep Singh Rawat and Gunner Vikramjeet Singh. They were provided immediate first aid and evacuated to 92 Base Hospital but succumbed to their injuries.Two militants who were attempting to infiltrate into the Kashmir valley were also killed in the gunfight.Major Kaustubh Prakash Kumar Rane (29) was a Sena Medal recipient and had joined the Army in 2011. He hailed from Thane, Maharashtra, and is survived by his wife and a son. The two Riflemen were from Uttarakhand, while the Gunner was from Tepla village in Haryana.